It’s time to let your voices be heard werewolf fans! Time to debate, discuss and decide (points to me for amazing alliteration)! There is one topic always brought up on this site, one debate I have been hearing for years and years, something that is argued over and over again. And that would be transformation! More specifically – what a werewolf transforms into. Wolf transformations vs. hybrid transformations. Which one is better – a werewolf who transforms into a wolf or a werewolf who transforms into a wolf/human hybrid? That is the big question Dear Readers. Check the poll below to answer! First you have regular wolf transformations, which I feel is the underdog here (har har). Judging by the million+ comments I have read most of you hate the wolf transformation. I don’t get that. Personally I love both wolf and hybrid transformations. I feel that each has its place. But some of you have this extreme hatred for any werewolf that transforms into an actual wolf like in Blood and Chocolate or True Blood. It just doesn’t make sense to me. I think a werewolf transforming into a wolf is perfectly logical. Then there are hybrid transformations – part man, part wolf. Everyone seems to love hybrid werewolves – especially movie makers. 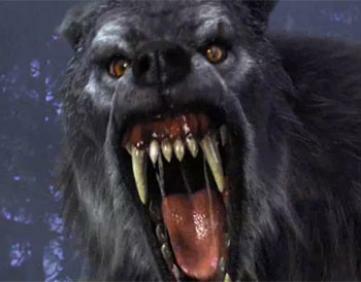 Nearly every werewolf in nearly every movie is a hybrid (fun fact: it’s cheaper to use real wolves which is why TV shows usually feature werewolves that change into wolves, it works better with their small budget). You have films like The Wolf Man, Underworld, An American Werewolf in London, Harry Potter, The Howling, Van Helsing… etc. all featuring hybrid werewolves. The thing is, there is no right or wrong werewolf, what a werewolf looks like is a matter of opinion. Every author and film maker has their own ideas. Then there are the countless werewolf myths and legends from around the world. Since werewolves are fictional creatures, there is no one truth, there is no right or wrong. I just depends on which werewolf look you like the most. Now here is the big question. Which do you prefer? A werewolf who transforms into a wolf or a werewolf who transforms into a wolf/human hybrid. To see which transformation is the ultimate winner, I have made a poll! Click away AND let us know in a comment below. Let the debates begin!